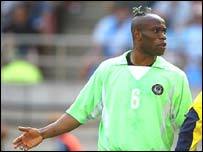 Attempts are gathering pace to stop young Nigerian footballers from wearing hair braids, dreadlocks and earrings. Many of Nigeria's top footballers, including their captain Jay-Jay Okocha and top striker Nwankwo Kanu, have their hair braided, but some football officials seem to have had enough. One senior football official has ordered the removal of any unacceptable players at an upcoming junior tournament. He said their behaviour was not culturally acceptable and promoted homosexuality. Just last week a leading government official from the information ministry, Otunba Olusegun Runshewe, castigated the trend setters on national television. "Our youths are now taking after our great football stars... don't forget that in the developing world that the braiding of hair and ear-rings have a sense of homosexuality," he told me. In a country where football is like a religion, these comments are prompting a heated debate on football fashion. 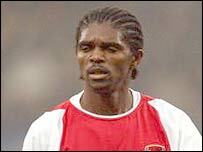 Some sports administrators feel a player should be banned from playing should he arrive on pitch with an unusual hairdo. "He should be even suspended for some years or even banned from playing football," said football administrator Ahmed Lawan. He has told those refereeing the Youth Championships to remove offending players even if they are the best players on the field. But not everyone down at Abuja's old stadium, where I went to see the under-18 Kaduna versus Jos match, agreed with these harsh measures. "I don't see it as if these guys are gay. I see them portraying Africa culture in another perspective," one male spectator said. "Times are changing, that's why these footballers are moving with the times. "When the Jay-Jay Okochas and the Nwankwo Kanus braid their hair, they are practising African culture. After all braiding hair is an African culture," another football fan said. But some female onlookers were more dismissive about men wearing jewellery and braiding their locks. "I don't see why boys... [are] turning themselves into girls when football is a man's game," one woman said. One of the players at the game with a jerry-curl hair style said his wet-curl look made him more noticeable and helped him score goals. "That's the way I want it. I want to be like a professional," he said. Although team captain, Sunday, said he did not approve of such foreign-influenced coiffure. "I'm from a well-trained Christian home, so I can't braid my hair," he said. But, however heated the debate, it will not change one fashion in Nigeria - the passion for football, where a major match will always bring the whole country to a standstill. President right to interfere on hair?